Western Challange: This year was...EPIC! Battle Lake, Minnesota. Site of the 2018 Great Western Challenge. Who could have predicted that this year’s Challenge would be…wait for it…epic! For the first time in years, Saturday beat out Friday as the best day. Don’t get me wrong, Friday was still awesome. It was the perfect day to get back on the ice and dust off the cob webs. The 58 sailors that made the trek to northern Minnesota enjoyed medium air, a huge sheet of mostly smooth ice and more scrub races than their necks could handle. But, ask anybody what made this year’s Challenge so special and they will all say Saturday. Without a doubt, Saturday was the day everyone will be talking about for years to come. On Saturday, the two fleets each sailed 5 adrenalin filled races. They raced very long courses on a huge sheet of very fast ice and in big, big winds. How big? Most of the day the wind blew about 18 mph. This was a day for the MS1. Those that had them were smiling. 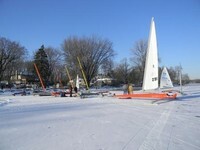 And for good reason: Word on the ice was that in race 4 the gold fleet raced in sustained winds of 20 mph with gusts to 26! Upwind and downwind the boats were just flying. Necks were snapped back at the weather mark and runner sharpness was measured at the leeward mark. Across the course, boat handling skills were tested. Surprisingly, for all the wind, there was very little carnage. At the end of Saturday, Ron Sherry held a slight lead over Hungary’s Peter Hamrak and Minnetonka’s John Dennis. JR Francis of Florida and Chris Berger from Chicago round out the top 5. Other Minnetonka notables saw Rob Evans in 6th and Mike Bloom in 8th. On Sunday, the breeze was even bigger than Saturday and was forecasted to build. Understandably, most of the sailors chose to enjoy the shelter of the pits. Less than a dozen boats even dared to venture out to the course. It was so windy that Mike Bloom made it out to the course without raising a sail. He loaded all his gear in his boat and reached out to the course under a dead stick simply by standing on his plank. Once at the course, he was not surprised to see it was mostly Tonka sailors out on the ice. Notably, J.D. was already out sailing a few hot laps. Pat Heppert was there with his beautiful C Skeeter. Scott Brown and Jim McDonagh were also out there ready to sail. But, after a short delay, the powers to be decided there would be no races and declared the regatta complete. A special Thanks is owed to Mercedes Auger, Deb Whitehorse and Pat Heppert for setting the marks, running the races and scoring. They are the greatest. And thanks to all the sailors who traveled near and far for making this yearly event such a success. How about the new scoring program used by Deb! Special thanks to the ice scouts: Local iceboaters Dirk Siems of Ottertail who took photos and measured this ice for a week. He sailed it on Wed. Battle Lake Super DN sailor John Everts who sailed and scouted the entire West End starting on Monday. Huge thanks to Mike Risbrudt of Ashby who checked other venues of Christina and Pelican Lake and arranged for the TV coverage out of Fargo on WDAY. I hope to get the link of his story today to share. Lastly, photographer, JH Peterson of Minneapolis. He shot over a thousand photos and has posted 8 of his best on Facebook Minnesota Iceboaters. He expects to add more. I mentioned this event to him last September!